Greenisland will enjoy a brush with Hollywood next week during filming on a new movie starring Liam Neeson. Scenes for the romantic drama, Normal People, are understood to have been shot at Whiteabbey Hospital and the Ulster University Jordanstown campus in recent days. And further filming is to be carried out at the Old Shore Road area. It will mean diversions for motorists along the key commuter route between Carrickfergus and Belfast. This possible disruption was flagged up earlier this summer by Mid and East Antrim Borough Council. Council said it had received an application from ‘Normal People Ltd’ (motion picture productions) wishing to undertake filming on Old Shore Road, Greenisland on Wednesday, August 8 and Thursday, August 9. 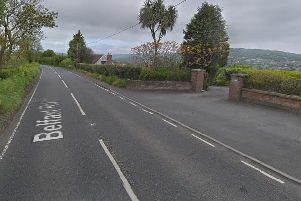 The local authority confirmed this week it has made an order to temporarily prohibit traffic from using Old Shore Road, Greenisland from its junction with A2 Shore Road to its junction with A2 Belfast Road on the two days between the hours of 8am and 8pm. “A diversion route will be signposted via A2 Belfast Road and A2 Shore Road,” council added. In April, a spokesperson for Northern Ireland Screen confirmed that Neeson, star of movies including Taken and Schindler’s List and Lesley Manville, who appeared in Phantom Thread and Another Year, were set to star in the production. It will be directed by Lisa Barros D’Sa and Glenn Leyburn (Good Vibrations). Summarising the plot, the spokesperson said: “Joan and Tom have been married for many years. There is an ease to their relationship which only comes from spending a life time together and a depth of love which expresses itself through tenderness and humour in equal part. “When Joan is unexpectedly diagnosed with breast cancer, the course of her treatment shines a light on their relationship as they are faced with the challenges that lie ahead and the prospect of what might happen if something were to happen to her.